Join the College of Charleston Friends of the Library and Department of History for an evening with historian David Silkenat as he explores the integral role of surrender in the American Civil War. The conflict began with a laying down of arms by Union troops at Fort Sumter, and it ended with a series of surrenders, most famously at Appomattox Courthouse. But in the intervening four years, both Union and Confederate forces surrendered en masse on scores of other occasions. Indeed, roughly one out of every four soldiers surrendered at some point during the conflict. In no other American war did surrender happen so frequently. David Silkenat provides the first comprehensive study of Civil War surrender, focusing on the conflicting social, political, and cultural meanings of the action. Looking at the conflict from the perspective of men who surrendered, Silkenat creates new avenues to understand prisoners of war, fighting by Confederate guerillas, the role of southern Unionists, and the experiences of African American soldiers. The experience of surrender also sheds valuable light on the culture of honor, the experience of combat, and the laws of war. When: Tuesday, April 9 | 5:30 p.m.
Where: Rita Liddy Hollings Science Center Auditorium (Rm. 101) | 58 Coming Street, at the corner of Coming and George Streets. Tickets: Free and open to the public; Registration is required. David Silkenat is a senior lecturer in American History at the University of Edinburgh. A native of New York City, Silkenat received his undergraduate degree in History from Duke University in Durham, North Carolina. After several years of teaching high school in Florida, Silkenat returned to North Carolina for graduate study at the University of North Carolina – Chapel Hill. From 2008 to 2013, he taught at North Dakota State University in Fargo, North Dakota. His 2011 book, Moments of Despair: Suicide, Divorce, and Debt in Civil War Era North Carolina, won the North Caroliniana Society Book Award for the work that "makes a positive contribution and appears to have the best chance of standing the test of time as a classic volume of North Caroliniana." 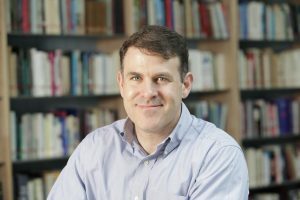 His 2016 book, Driven from Home: North Carolina's Civil War Refugee Crisis, also won the North Caroliniana Society Book Award, making Silkenat the first author to win the prize twice. Silkenat's work has also received the William F. Holmes Award from the Southern Historical Association and the Harry E. Pratt Memorial Award from the Illinois State Historical Society. With his University of Edinburgh colleague Frank Cogliano, Silkenat hosts the podcast The Whiskey Rebellion. This event is co-sponsored by The College of Charleston Friends of the Library & The College of Charleston Department of History.